In last week’s podcast on “The Human Path” I talked about gunshot wounds in a post-disaster environment. I know that this is a little bit of a depressing subject, because for a serious gunshot wound, especially a high-velocity round to the torso (as we discussed), there is not a very good chance of survival to be expected without higher medical care that includes surgery and pharmaceuticals. However, to move back into an area that is one of those more optimistic topics for the next few weeks, I would like to discuss wound healing and herbs that work very well at helping wounds of all types, heal much more quickly. This is one of those areas of acute injury (or illness) that plant medicine does quite well with, and involves understanding a little bit about the physiology of wounds and how they heal. Primarily, we want to reduce or eliminate infection, reduce inflammation and increase circulation to the area through creating new blood vessels (angiogenesis) and helping rid the area of toxins and waste, while speeding up the proliferation of new tissue. Over the course of this 2-part podcast, I will talk about the process of wound healing and specific herbs we can use to help tissue heal, from broken bones, to bruises, sprains and strains, to open lacerations, burns and abrasions, and even internal injuries to organs and organ systems. Additionally, I will talk about the roles that nutrition and lifestyle play in the rapid healing of injuries and acute illness that causes tissue damage. 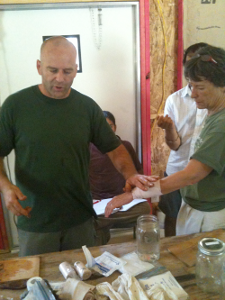 Listen to this broadcast on Wound Healing and Herbs, Part 1 in player below! 1 Comment on "Wound Healing and Herbs, Part 1"
We have successfully used activated charcoal poultices on wounds that look like they’re getting infected. I had a cut that got infected recently and the charcoal poultice cleared it up overnight. Every first aid kit should include it.